I think that this is a very nice article. I am no authority on this subject but I find it acceptable to have a real portrait of a Prophet, provided it indicates praiseworthiness. We see portraits/statues of Jesus, Moses, Abraham, Solomon, Krishna, Socrates, Confucius (peace be on all of them) everywhere and I have not seen any movements among Muslims against such portraits. No objections despite the Quranic statement: We make no distinction between any of the Messengers”. !!! If/When Jesus returns to earth, will anyone object when CNN shows him all over the world? Well said Dr. Mohamed Boodhun. I object to portrait of any Prophet, the biggest objection I have with a portrait of any Prophet,human tendency to revere an image that is not 100% accurate representation. Hmmm … This frieze has been there is the Supreme court for the last 80 years and has not hurt anyone physically, morally or spiritually. It has only introduced the Holy Prophet to countless visitors of the Supreme Court. We only need to show the world that he taught self defense only and never suggested preemptive wars and we have plenty of materials to demonstrate that under the category “Muhammad,” under the tab of “Law and Religion,” in the menu under the header picture. Humanity in general has steadily grown away from idol worship, so the risks that existed 1400 years ago are not realistic any more. The Muslims do not have to make idols or pictures of prophets, but, if non-Muslims or others do that it need not be our top priority to resist. Our top priority should be human rights for all Muslims and every human being. Very good and informative article I agree with the contents and also with Dr Zia Shah. Dr Bhoodhun has raised a very interesting point about Jesus, as the majority of Muslims believe in his return, what would their reaction be when the Media show him or his images throughout the globe? A picture helps us its just being human. Its part of education its normal and natural. Indeed there is no need to resist or retaliate, but to express our concerns humbly as there is no compulsion on anybody and nothing should be enforced on anybody but it would be wrong to be silent and not support the truth while you have been enlightened by it through Islam. For if you you do not up for your basic belief being compromised then making such assumptions that ignorance does not exist in the present times will be a mistake. This is an informative and timely article. I do wish the author had said more about the opinion of the four major Sunni imams (Abu Hanifah, Malik, Ahmad bin Hanbal and Al-Shafi’i) about images. Ibn Qudama is pretty late – the basic opinions were settled long before that, and are in the record However, the use of images in Muslim artifacts, art and even architecture goes back to the beginning of Islam, and while it may have waxed and waned regionally, a sustained blanket prohibition never really existed. The use of the Prophet’s images is much rarer, but also fairly persistent. One concrete piece of evidence for early controversy on this topic comes from the numismatic history of Islam. Before 77 AH, the coins used in the Muslim caliphate were either modified Sassanian and Byzantine coins with images of the respective emperors, or coins minted by the second Umayyad caliph, Abd-al Malik, many of which had a picture of the caliph or, in lower denominations, of ducks, flowers, etc. However, strong objection gradually developed to these images, and in 77 AH, Abd-al Malik issued a “reform” coinage in gold and silver that had no images. This remained the standard style in the Muslim world for the next 400 years, and in some areas, much later. Clearly, there was enough controversy about the coins with images at that time. It has also been noted that, under some interpretations, the Islamic prohibition on images applies only to images that cast shadows, i.e., to statues. Given the concern with idol-worship, this makes some sense. Just imagine that any Muslim like to draw the picture of Hazoor saw in the shape of conqueror or the warrior or the brave person punishing those who fight with Allah.The other one draws him as a Noor in the shape of moon or Sun. Yet someone else shows him in the Jannah with the pious ladies of Janna, and so on where are you going to draw the line. How are you going to define good depiction and bad one or the genuine one. It is slippery slope sir. The Muslim Times does not want to draw any new pictures. We just realized that there are millions of pictures in Shiite Iran, so this is nothing new, as far as the Muslims are concerned. We just do not want to quibble with the non-Muslims on this issue. 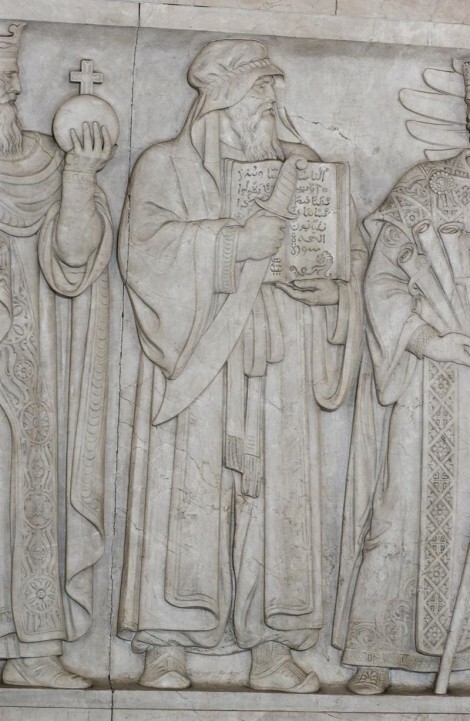 Additionally, this 80 year old frieze from the supreme court puts the Prophet in very bright light, as a great law-giver of the world, and as we are jealous of his honor, we do not want to not share this reality with the world. There is no slippery slope here as it has existed for 8 decades already, introducing the Holy Prophet to countless visitors to the Supreme Court. This we believe is in service and love of the Prophet and our track record is a clear testimony to that. The worst sort of idol worship is that desire that leads us to say and do those very actions that our soul abhors; and the worst set of idols are those that we carry around with us in our hearts and minds! Idol worship has been a phenomenon with human beings since time immemorial, and this is set to continue, albeit changing with times in form and process. It would not be the picture of the idol of a prophet that would induce anyone to idolize him, it would be the weakness within each one of us which would set us to do so. The reason for doing so in not merely because of our awe and respect for the prophet but because we want them on pedestals that we can later declare to be unreachable by normal human beings like us. This would give us the chance to come out with the excuse that they are so exalted and we are so lowly…how can we live the way they have. This has, and always will be the way ahead. Despite the Holy Quran clearly stating that Allah intended for one amongst them to lead human beings towards Him, else he would have sent Angels as messengers, we still deify those very same messengers who were mere mortals as us; those who eat food, feel pain, fall sick and die due to natural/unnatural causes. The blame is not in the painting, nor is it in the stone carving; the blame is in the weak hearts and souls of those who prostrate before them. Thank you every one for your useful comments. 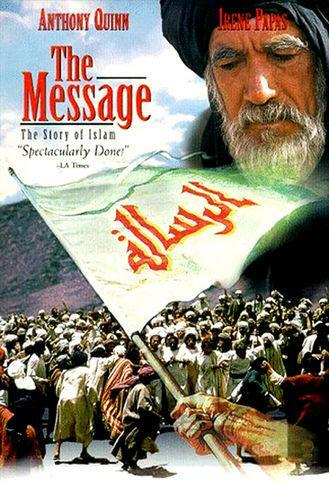 Non-Muslims make pictures of the prophets and there are countless movies about Jesus and Moses, may peace be on them. 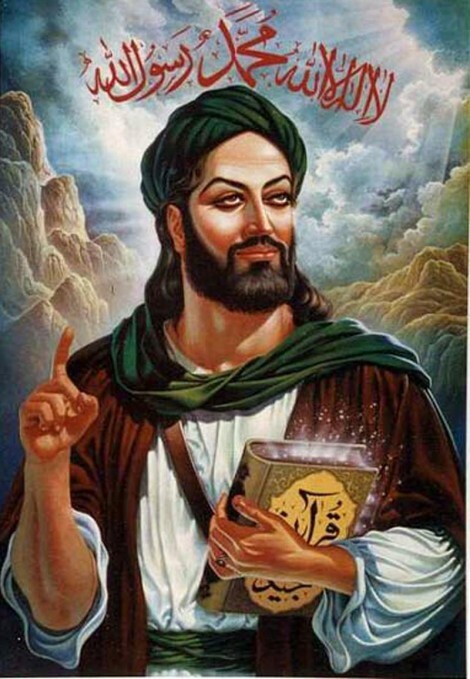 Shiite Muslims very commonly make pictures of the Holy Prophet Muhammad, in Iran. These are ground realities and the Muslim Times can do nothing about these, except to acknowledge these facts. We are not creating any new pictures. Our focus is only that the Holy Prophet Muhammad, may peace be on him, has been recognized as a great law giver, by US Supreme Court, since 1935. With this I am ending any discussions in this post and no further comments will be approved in this post. Muslim should not support the portraying of Proph. S.A.W. Image because this article must be act of non-believers because we must think beyond our generation when ppl might start worshipping the image as there God, This is unfair while we battle with some association like tijaniyat(senegal) that believed and worshipped Niyass like prophet.if we have image of him then are we not entitled to having it inside our home ? Which is idolised… We must beware ! 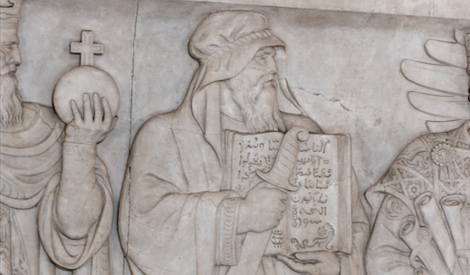 In that sculpture we can see a prophet holding a manuscript and sword. Can anybody tell me what’s exactly written on it. Manuscript signifies the Quran and he is holding the sword not by the handle but the blade, which signifies defensive war to seek peace.